Published on November 17, 2013 November 29, 2013 by Jennifer S.
Over the past couple of years I have become much more involved in Hartford’s Jewish community than I ever thought I might. Having never had any formal Jewish education, I decided to take an Intro to Judaism class to fill in some of the gaps in my knowledge. This trip is continuing that connect the dots theme. I have started telling people that everything I know, I know from the Hartford Jewish Film Fest. Everything I know about army recruits getting their first guns, priests/cardinals who were born Jewish, the prime ministers, and probably a few more topics, I have learned during our screenings. Coming here and seeing the recruits, hearing about a Jew-turned-Catholic researching at Yad Vashem, and seeing Independence Hall really strengthens my understanding of these issues. 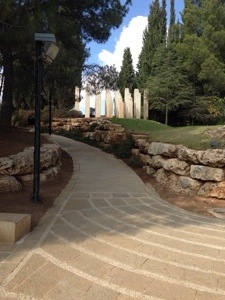 This morning we visited Yad Vashem, the Holocaust memorial. The memorial to all the children who perished moved me the most. Our visit was not going to be too long to begin with, but the French president was arriving in the afternoon and the museum was closing early. Our tour guide hit the main points, but having read a lot of Holocaust based fiction lately, I am already familiar with many of the common themes. This is supposed to represent a class photo. Since the students being depicted died, the stones are all broken at the top. We then headed to Tel Aviv. Along the way we stopped at the approximate location of David’s fight with Golaith. Today it’s a cabbage patch, and I was looking for Xavier Roberts. 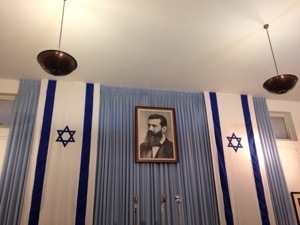 Our first stop in Tel Aviv was at Independence Hall. Having been in Philadelphia just over a week ago, I’ve hit Independence Halls in two countries in one month. I can’t imagine that’s too common of an occurrence. Jaffa, our final stop of the day, is a gorgeous old city. Would have been nice to see it in daylight, but there are only so many of those hours in a day. After walking around a bit, we had dinner at a fish restaurant. Things got a little exciting as we boarded the bus to return to Jerusalem. A young Israeli, completely stoned, boarded our bus. Kudos to our bus driver and tour guide for swiftly dealing with the guy. You can imagine the scenarios going through all of our heads. Fortunately, none of them was realized.